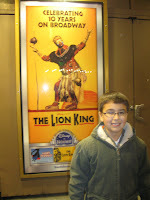 I saw The Lion King for the first time last year and all year long I wanted to go again. My grandma got the tickets for me for this Christmas. This year I sat further back. It was different because we could see the whole stage. My favorite part was the beginning when the three people - the woman is in the front and the two guys are in the balcony. My other favorite part is when that woman sings that song to Simba and then swings in on the rope. I also like I Just Can't Wait to Be King. The Lion King makes me feel happy. It's awesome. I want to see it every year. Great review, Cody. Happy New Year to you and your lovely Aunt Sarah! Wonderful review, Cody. I saw "The Lion King" last year for the first time, too, and I also loved it for all the reasons you mentioned. It definitely makes me feel happy, too. Happy new year to you and your aunt. I'm glad you're having such a great adventure in New York City! Yay! Fantastic. I'm glad you & auntie have so much in common.